Meal assembly centers are not necessarily a return to the home-cooked food generations grew up eating. For one thing, no one actually cooks at them. 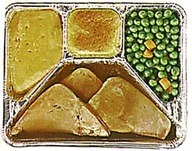 The chopped vegetables and frozen meats at most of the centers come from industrial food suppliers like Sysco, and recipes include ingredients like canned wax beans and that old hot dish standby, cream of chicken soup. Nothing is actually cooked on site, although workers in the back room might chop scallions or slice raw beef into serving sizes. SEATTLE — Jodi Robbins and her family were on a grim dinnertime merry-go-round.Takeout pizza was a mainstay, except on the nights when Chinese food seemed more appealing. When Ms. Robbins cooked, it was spaghetti or tuna casserole over and over, with rarely enough time to make a salad. Fair enough. As the article says, "Their routine was expensive, fattening and boring." Absolutely. But how does spending a two hour chunk of time at a meal assembly center preparing "a rotating menu of mostly stews and casseroles designed to be assembled in freezer bags or aluminum trays, then taken home to be baked or simmered in a single pot," made from cafteria quality ingedients help? This chain seems to be making its bones by adding "inconvenient" to the "expensive, fattening and boring" equation. Also, my objection to this business is not a question of insisting that parents ("Moms" as the Times call them) travel to Brittany to harvest their own fleur de sel, or generally spend more time making meals, and eschew this kind of shortcut -- these meal assembly centers seem distinctly less convenient than making a meal at home, never mind the risk of getting cream of broccoli all over the interior of your Nissan Quest. The secondary mystery is why the Times continues to recycle this story. Last time it was Hesser, and now she has punted to Kim Severson* and that Salman Rushdie of mac and cheese, Julia Moskin. I vented thus in re Dream Dinners last time, though I hope nobody comes here for stock tips--unaccountably, Dream Dinners appears to be growing more rapidly than Kenny Rogers Roasters. I never thought threre could be a franchise concept that made me nostalgic for Boston Market. Can anyone explain this? *Severson's post-Katrina NOLA food coverage has been solid, and more importantly, persistent. Update: Ms. Culi makes it clear she gets it by missing the point. She had me at the soccermoms turned flensers. Cod writes: "Can anyone explain this?" I mean, I understand about the stress of dinner prep and all, but I don't understand the so-called appeal of this "Dream Dinners" concept. Sounds dire to me. But what is it that has made Americans "uncomfortable in their kitchens," as the article puts it? I mean, it's a fact that people aren't cooking, don't like cooking, don't even bake their kids a goddamn birthday cake, etc. (NYT had a piece on this last week, I think -- and I can affirm based on personal observation.) Why? What's the phobia? Folks from all over are calling in to tell me that they use organic or 'good' stuff (they're not really calling in). But one woman's 'organic and local' is another woman's wilted. I don't know what to believe. Since this is not a Mommyblog and since not very many Mommies like me anyway, I'll just come right out and say it: stay-at-home Mommies waste a lot 'o time. I have seen several stay at home Mommies take two hours to do things that don't really need to get done at all. The longest lunches I ever have in my life are consistently with stay-at-home Moms. Still, no one has to LIKE cooking, and even a stay at home Mom can have their priorities up their asses I mean have different priorities. I grew up in an extremely emancipated household with two working parents, and my mom, the non-cook, refused to let my dad, the EXCELLENT COOK WHO LOVETH TO COOK, do any week-time cooking. She had and still has this thing about doing the wifely in a very June Cleaver sort of way completely inappropriate to my dad's family's communist leanings and the fact that before marriage she had never seen a kitchen (no lie). AND SHE WON'T LET THE MAN EAT KASHA FOR BREAKFAST NOW THAT HE'S RETIRED! Two hours for 12 different 'entrees' (gawd I hate that word in this context) does sound like asskikn tempo, I have to admit. But it's a different cultchuh. This service is definitely not for the Jews. Q: How old are Kim and Julia? See what Abundance is; love yourself for what it is, not what you’re missing, or what that can be better, but for what it is at this present moment. I love cooking. I grew up in an extremely emancipated household with two working parents, and my mom, the non-cook, refused to let my dad, the excellent cook who love to cook, do any week-time cooking.But there are some people who don't like cooking, don't even bake their kids a goddamn birthday cake, etc.